When to Move All-in in Poker? In both tournaments and cash games you’ll be challenged with difficult decsisions to move all-in, however knowing the right reasons and situations to do it is really important, especially for new players who move all-in too often. (For understanding when to move all-in in tournaments read this article). Learn to Go All-in At Full Tilt Poker By Downloading Here! 100% up to $600 Bonus! When you call a raise in poker it’s either for expected value, or like a true LAG, to have intent to out-play your opponent on a later street through methods such as bluffing, floating, drawing or whatever. However moving all-in is completely different to flat because it involves risking your total stack, so the reasons for doing it change. We only ever do this for 3 reasons: either to force our opponent to fold, to shove for value, or because we’re pot committed and need to double up. Sometimes when you’re ahead in poker and your opponent is pot-commited or if you have a very loose table image you can extract more value by shoving your premium hands in late position, rather betting for thin value. For example if we’re playing a $1/$2 short hand cash game, I raise $7 preflop with KsKc and two players call, by the time the flop comes and someone cbets, the pot will be worth approximately 60% or more of an average player’s stack. On a flop like 10dKdQh, with multiple outs, its usually best to shove here and prevent small-stack drawers getting value to call or shove on an un-raised board. Another reason to regularly shove or overbet in No Limi Holdem is that it loosens your table image from being viewed as a tight nit that helps you get paid off more with big hands – especially when you shove in position. Because a shove looks weaker when you’re 3betting 10% of your hands pre-flop rather than 3%, it means you’ll get better caller equity by dominated hands. Remember that doing this also damages your fold equity for bluffing, so be careful not to become overly predictable with your hands e.g. it’s important to maintain a “balanced” shoving range. As well as being a defense mechanism to stop drawing hands getting value, shoving all-in can also win you pots after you miss a draw or pick up a scare card. Even if you don’t have the best showdown hand in heads up, you can usually force a weak opponent off a non-premium hand like mid-pair or a low flush. By far the most common problem new players make is moving all-in far too often on the river, especially in 10-handed games. The problem however is that experienced players will be reading you and if you make a bluff that doesn’t add up then you’ll be getting called down. For example, ask yourself if you actually had the best hand why would you shoving all-in on the river rather than value-betting? In these situations shoving can be a sign of weakness rather than strength. Example of Pure-Bluff All-in: $1/$2 short handed cash game. 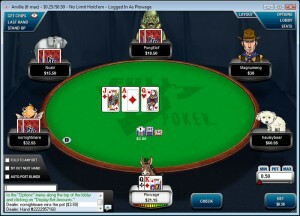 Player A raises $8 preflop and you call with 77 along with two others. Flop brings 2h9h4s, you missed your set but it’s likely so did everyone else. In this situation if everyone checks and then someone raises in late position (stealing position) you should shove all-in. There’s only one overcard on the table and anyone with a bigger pocket pair would’ve definately 3bet pre-flop at these stakes.